Today's post seems so inconsequential today, as I struggle finding the words, knowing what Monet and her family must be going through today. Please keep Monet from Anecdotes and Apples and her family in your prayers, especially for Joshua. Spring is still eluding us here in Chicago Land, so I continue to bake and cook like it is Spring. I was having company over the weekend, Joanna and her husband, and wanted to try this new recipe that I got from Rachael Ray. Of course, I couldn't leave the recipe alone, and had to add lots of lemon, zest and juice. The original recipe called for herb garlic cheese like Boursin. I wanted to lighten up the crostini a bit, so I made my own with light cream cheese, garlic, fresh thyme, and a little lemon zest. and juice. I also put lemon juice in the the chopped Baby Artichokes. These are the Baby Artichokes before cleaning. 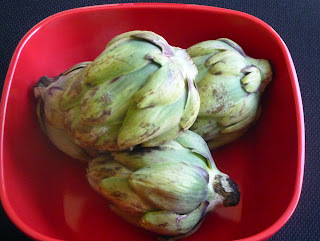 These Baby Artichokes are so cute, but there is a certain way to clean and cook them. After rinsing the chokes, snap off the lower petals, until you reach the yellow-green core. Use a knife to cut off one-half in of the top.of the Baby Artichoke. Trim the stems and all remaining dark green areas from the base. Now you can slice, halve, or quarter, depending on what is needed for your recipes. Once the chokes are cut, soak in lemon or vinegar water to keep from browning. Here is a link to everything that you wanted to know about Baby Artichokes, Preparation of Baby Artichokes. Steaming is the preferred way of cooking, either in a steamer or in the microwave. · 1/4 cup chopped fresh herbs or whatever fresh herbs you like, such as basil, flat leaf parsley, oregano, etc. In a medium size mixing bowl, toss together the artichokes, 2 tablespoons olive oil, garlic, herbs, zest and juice of one lemon, and some salt and pepper. Set aside. Arrange the bread slices on a baking sheet and brush lightly with the remaining tablespoon of olive oil.. Pop the bread into the oven and toast until golden brown, about 5 minutes. Let cool. 1-Tbsp fresh herbs, chopped or dried; thyme, flat leaf parsley, or herbs of your choice. Combine all ingredients in small bowl and mix well. You can make this spread ahead of time for flavors to blend. Spread some soft cheese over each slice of bread, top with a spoonful of the marinated artichokes and serve. i just hope that her family & friends will keep her memories forever, and the pains of loss heal quickly. i loveee anything artichoke or spinach flavored. yum yum. I love artichokes, and this recipe looks so wonderful. My heart breaks for Monet and her family. It's so awful. First time to your site. Just found out about Monet. My prayers are with them. Your recipe looks great. What a great appetizer! Thanks for sharing!! They look refreshing and deliciously healthy, your crostinis. I also read about Monet's torchering family ordeal. Makes everything we do just roll into insignificance and appreciate how life can be so short. I certainly appreciate all of your comments and support. They make us happy. All of us are sending Monet all of our love and prayers, and that's what our community is all about. Suzy- thanks for stopping by my blog. Hope to see you again. I just read on her facebook page about her sister. What a tragic loss for them. So young!! They are definitely in my prayers every day! You did such a great job making your own herb cream cheese and of course, I love all the lemon in there!! I bet it went perfect with the artichoke! Love baby artichokes! These crostini definitely say Spring to me! And your addition of the lemon must really brighten it up. Yum! 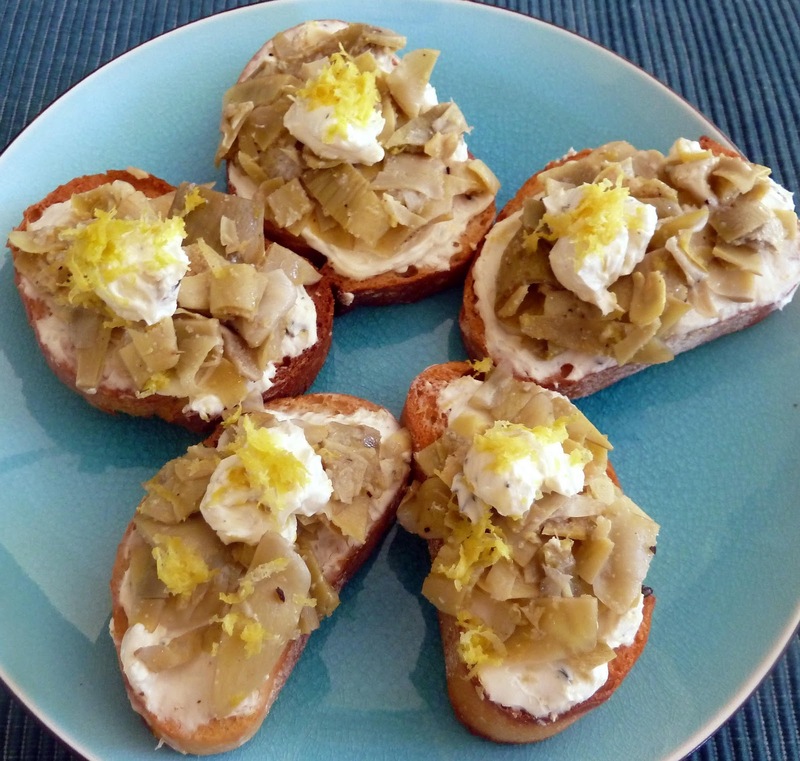 Wonderful appetizers, love the lemony flavors in combination with artichokes! This seems like a wonderful, super flavorful appetizer! Oh sweet friend...what a gift from God you have been....your words of encouragement and gifts of kindness have been a light for my dark days. And how did you know that I adore artichokes? Ryan and I just had one tonight. Thank you for sharing, for creating, for inspiring me to remember all the beauty and good in this world. Many blessing tomorrow and in the days to come this week.